As the weather was quiet nice yesterday I thought I'd go out and see if there was anything worth shooting. Well it basically ended up with me being out for half an hour, taking three pictures and heading back in due to lack of inspiration. I did however take this one which I am very happy about. Especially since that whole street photography thing is not really one of my strengths. 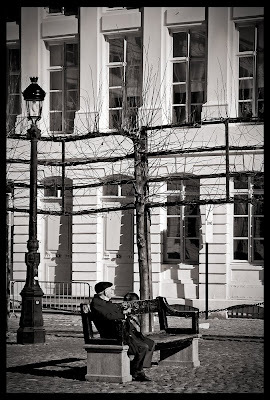 This one is taken at the "Place des martyrs" in the center of Brussels. The iPhone version is over here. Nice Joost, I love to see ext pics from brussels! iPhone wallpaper pack the second!